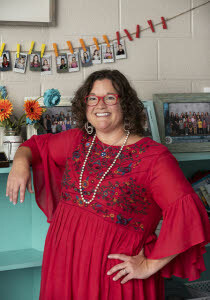 A Franklin Special School District teacher known for her communication and leadership skills was named the 2018-19 Tennessee Teacher of the Year during the annual honorary banquet on Thursday night. Melissa Miller, a first grade teacher at Franklin Elementary School in Franklin, is the recipient of this year’s top honor. Miller has been teaching for 19 years in Tennessee and is a National Board Certified Teacher. Viewed as a teacher leader in her school, Ms. Miller serves as a grade-level team leader and a field experience mentor in addition to serving as a district curriculum and technology trainer to better equip her fellow educators with skills to improve their teaching practices. “Teachers are the single most important factor in improving students’ achievement and Tennessee students deserve great teachers leading each and every classroom. The educators honored at the Teacher of the Year banquet are leading their students to impressive gains and growth across the state and it is my privilege to recognize them for their work. I am thrilled to usher in Melissa Miller as the 2018-19 Tennessee Teacher of the Year and look forward to working with her more in the year to come,“ Education Commissioner Candice McQueen said. Ms. Miller works hard to teach her students to believe in themselves and to create a positive environment in which they can learn, grow, and thrive. She has a positive attitude and loves to share her personal story with her colleagues in hopes of igniting their passion. “What we do changes the world for the children that we have the great privilege of working with each day. Teachers have the power within to make monumental change – it’s about uniting teachers, instilling a drive toward a common goal, receiving coaching in best practices, and delivering rigorous curriculum embedded with high expectations no matter the students’ background,” Ms. Miller has said. Ms. Miller follows 2017-18 Tennessee Teacher of the Year Cicely Woodard, a middle school math teacher at Freedom Middle School in Franklin, who was also thanked for her service during Thursday’s event. At the banquet, the department also recognized finalists who earned Teacher of the Year titles for each of Tennessee’s three Grand Divisions. Miller was recognized as the Grand Division winner for Middle Tennessee. 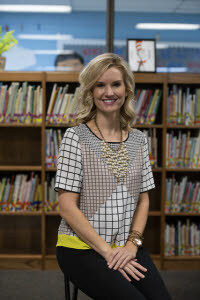 Lori Farley, a media specialist at North City Elementary School in Athens City Schools, was recognized as the Grand Division winner for East Tennessee. Ms. Farley believes that everyone can be a leader, and her personal mantra is lead from where you are no matter what title you hold. She is perpetually seeking growth opportunities within and beyond the school system such as pursuing leadership opportunities, taking on a deeper role in school technology, and serving Gifted students. Michael Robinson, a high school social studies teacher at Houston High School in Germantown Municipal School District, was recognized as the Grand Division winner for West Tennessee. Mr. Robinson serves as a leader in education and is a Blue Chip mentor for new teachers at Houston High. 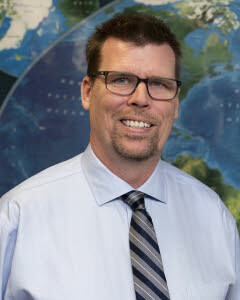 As a geography and history teacher, he makes it a priority to travel as part of his professional development, both by leading student tours and also presenting at and attending conferences in countries such as South Korea, Singapore, China, Germany, Poland, and the Czech Republic, among others. As Tennessee Teacher of the Year, Ms. Miller will become a spokesperson for teachers in the state, serving as Tennessee’s representative in the 2019 National Teacher of the Year Program. In addition, she will be asked to share her insight from the classroom as part of committees and working groups with the department. The nine Teacher of the Year state finalists, who represent all regions in the state, serve on the Teacher Advisory Council during the 2018-19 school year. This council acts as a working group of expert teachers to provide feedback and inform the work of the department throughout the school year. Additionally, to provide continuity and leadership, the three Grand Division winners will continue their term during the 2019-20 school year.